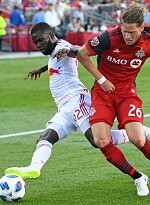 An early goal from Kemar Lawrence and a spectacular game, including a penalty save, from Luis Robles were enough to give Metro a 1:0 win over Toronto. It was far from a dominant performance from Metro, but a road shutout is nothing to frown at. Jesse Marsch was forced to make one change, putting in Alex Muyl for the suspended Daniel Royer. The much-maligned Muyl looked to have scored midway through the first half, but the goal was (probably incorrectly) called offside. The game was a tale of two goalkeepers. Toronto's Alex Bono faced two shots the entire game, and made a meal on the first. In the 4th minute, off a corner kick, the ball landed with Lawrence, who took a shot from outside the box. The ball went through Bono's hands and into the net. On the other end, Robles was spectacular. His eight saves included three breakaway opportunities, but the obvious highlight came in the 78th. On the previous play, Tim Parker fell to the ground as Metro was trying to clear the ball. After VAR, it was decided that the defender's hand made contact with the ball. On the day both World Cup games were decided in shootouts, Sebastian Giovinco stepped up, and Robles guessed correctly to his right, slapping the ball away. At the end, Metro ran off 1:0 winners. Amazingly, this is the first time Metro won by that supposedly popular score in a league game since last year's home opener. It was their first such road win since September 2016. Lineup: Robles, Lawrence, Long, Parker, Lade, Adams, Davis, Valot, Muyl, Romero Gamarra, Wright-Phillips. Subs: Etienne, Rzatkowski, Kutler.